Orticola is a not for profit organisation planning and organizing the Milan Flower Show, acting for the benefit of the Milanese community through socio-cultural initiatives and projects financed by proceeds from the Orticola Flower Show. Since 1854 the heritage of horticultural knowledge, records of historic Lombard nurseries, the intention to pursue the culture of the beautiful and the protection of the natural territory are transmitted through the management of specialised archives and socio-cultural activities such as tours, conferences, periodic meetings and a consultation service for members. Count Francesco Pertusati and a group of his friends, all young Milanese citizens, set themselves the goals of exchanging news and knowledge about flowers, plants and the beauties of nature in 1854, the year in which Francesco Pertusati founded the magazine“I Giardini”(Gardens). Orticola was born with this first venture and the botanical magazine became the official organ of the Lombard Horticultural Society. 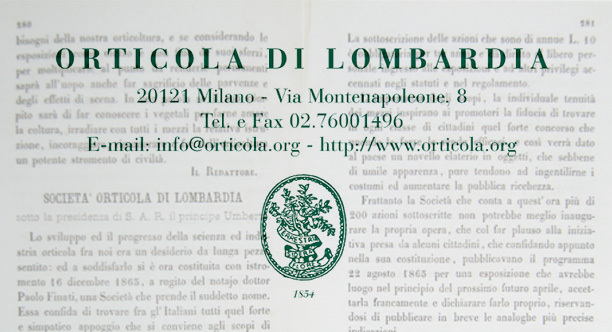 On December 16th 1865, the act for the foundation of the“Società Orticola di Lombardia” was signed in Milan. This new association, a European prototype modelled on the “Société d’Horticulture de France”, was favourably received in Milan and elected protagonist of city life, with appreciation for its contribution in diffusing an interest and love of plants and gardens. Today, after more than 160 years, Orticola is still one of the foremost Italian institutions to promote the awareness of plants, garden art and spontaneous landscape. “In the mid nineteenth century, a group of young Milanese men met in the garden of Arcadia around “Anthophilous, the flower lover”, Count Francesco Pertusati. The aim of this “green movement” of yesteryear was to promote horticulture, the study of botany and landscape design. In 1854, the same year as the invention of the internal combustion engine and Japan’s opening to the West, in a Risorgimento climate, already cosmopolitan, the first edition of “I Giardini” was issued, a magazine illustrated with superb engravings of flowers and fruit. A few years later, after the Unification of Italy, the Lombard Horticultural Society was founded on the 16th December 1865. Since then the members have never relinquished their search for the most beautiful flowers, in parks and glasshouses all over the world, as well as in courtyards and small vegetable patches in the city. 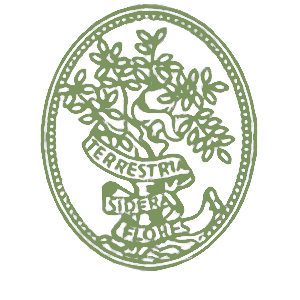 At the beginning of the new millenium Orticola has much to tell and, with its motto “Terrestria Sidera Flores”, brings to mind many vicissitudes in Milanese and Lombard history through its best-loved gardens and reminiscences of the people who brought them to life. If flowers are stars on earth, Orticola and Milan are at the centre of that firmament”. 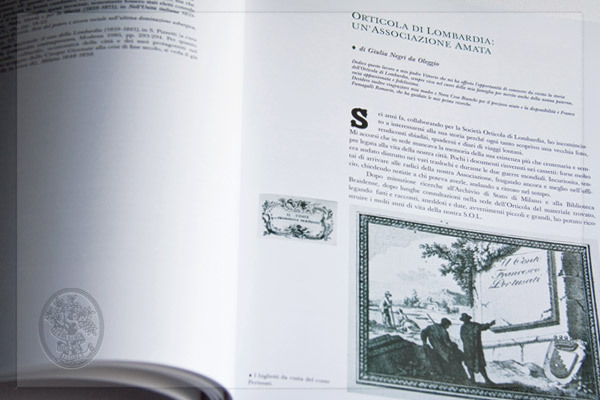 From the book “Terrestria Sidera Flores” History of the Lombard Horticultural Society. Since 1996 a committee within the society deals with the organisation of the “Orticola” Flower Show in the public gardens in via Palestro in May, with the aim of presenting first-rate horticultural production as well as collecting funds for open spaces in the city, with the patronage of Milan Municipality. It is a festive, cultural occasion, an enlightened “expenditure” to benefit the community, with the aim of collecting funds for Milanese public greenery. The Lombard Horticultural Society has its headquarters in Milan, in via Montenapoleone 8. Spanning generations and anticipating its era, the Lombard Horticultural Society is present on-line with an institutional site, and also appears on the main social network platforms, including Facebook, Twitter and Instagram, with news regarding the socio-cultural and philanthropic activities that it offers to the city. It also publishes articles on the blog “IO e Orticola” hosted by the women’s magazine IO donna from the “Corriere della Sera” Group, in agreement with Eberhard & Co. Opening times: from Monday to Friday from 10 to 12.30 a.m.
Like every year, for more than twenty years in Milan, Spring is Orticola ..!